Have you spotted larger than usual ants inside your home or cottage? Is sawdust recurring in the same area? Before you begin to panic, ants have colonized almost every landmass on Earth, so your situation is not unique. There are a number of steps you can take to help you determine whether you have a serious problem with carpenter ants. Carpenter ants reside both outdoors and indoors in moist, decaying or hollow wood. They are also quite happy to nest in sound structural wood. 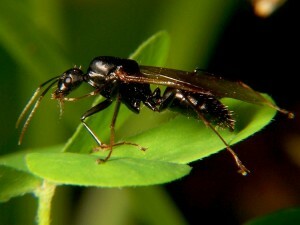 Seeing large-winged reproductives is generally a sign that carpenter ants have been present for 3-5 years, and the colony is well-established. Should I Be Concerned About Carpenter Ants? You will only see about 10% of a carpenter ant colony. During the summer, the rest of the colony could be located outside in dead tree trunks, stumps, logs, or under fallen logs and stones. If you notice a carpenter ant in your home or cottage before May, when it’s still relatively cold out, the colony has invaded your structure. Carpenter ants are well known for their ability to damage wooden structures. Since they prefer moist or decaying wood, carpenter ants can be a sign of a moisture problem in your home or cottage. Ant colonies can also nest in houses without attacking structural wood. They use hollow spaces like wall voids, attic spaces, and doors. They can even be found in styrofoam insulation. Keep your cottage or home clean, especially the kitchen. Ants are attracted to food sources. Move firewood piles away from the home and remove dead tree stumps. Caulk around windows and eliminate other moisture issues. This can include any wood on soil contact. Correct humidity problems in your home or cottage. Full interior and exterior treatments consist of a visual inspection of “hot spot” areas, treatment of cracks and crevices, wall voids, attics, crawl spaces, window and door frames, baseboards, electrical outlets, pipe chases, decking, tree bases and stumps, and perimeter of the structure. Suggestions will also be made for control measures. This can include the removal of overhanging tree limbs or dead tree stumps, the sealing of gaps and cracks, etc. Treatment can either be a combination of chemical/residual/ULV or bait and dust. Both are equally effective, but bait and dust generally are a little slower to take effect. A bait and dust carpenter ant treatment will require a minimum of 4 visits, 2 weeks apart from our licensed pest control technicians. Our treatment is fully warrantied for a year. If after 21 days following treatment there are still signs of ant activity, we will return to repeat the procedure to specific areas or all areas if necessary. 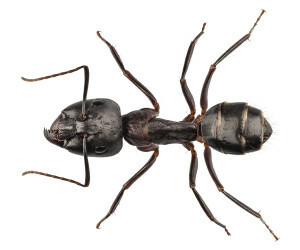 Contact Miller Pest Control to learn more and get rid of carpenter ants.